Girish, an accomplished musician of many genres, former monk infused in spiritual practice, loving wordsmith linking lyrics and rhythm in a blissful musical event, sings traditional Sanskrit mantras with a modern, funky, yet deeply devotional twist. What is kirtan? Kirtan is an ancient practice of chanting mantras or sounds that contain transformative and healing energies. 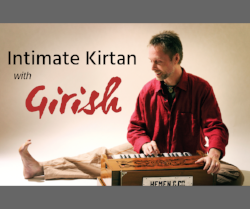 Girish invites his audience at his kirtan concert to participate by singing along, call and response chanting, and dancing. Girish has been recommended and featured in "O, The Oprah Magazine", "Yoga Journal" "Spirituality and Health Magazine", "LA Yoga Magazine", "Common Ground" and "Yogi Times." Girish's original music catalog of five albums is popular in yoga studios and music festivals all over the world, and he recently published a book entitled "Mantras and Music".